Topics Include: Wild were shutout two out of three games this week. [4:30] Where did this season go wrong? [7:07] Do the Wild make the playoffs if not for injuries? [18:35] An early review of the Wild's in-season trades. [22:47] Draft lottery time! [37:27] Bruce Boudreau Quote of the Week! [44:10] Kirill Watch! [48:23] Central Intelligence! [43:30] MLB Jerseys! 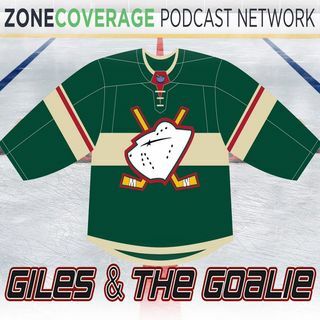 [56:05] A Zone Coverage Podcast Network Production Follow the Crew on Twitter: @BenRemington | @gilesferrell | @GatGWildPodcast ... See More Follow Zone Coverage: @ZoneCoverageMN Listen to the show on Libsyn, iTunes, Stitcher, SoundCloud, Google Play, iHeart Radio, and YouTube. Follow us on Facebook, Twitter, and Instagram.